Custom cabinet door stained glass is the perfect way to bring extra color, personality, charm, and style to your home and stained glass cabinet door inserts are beautiful and simple to install. Stained glass windows for cabinet doors can hide what's in your windowed cabinets but don't worry; you won't have to replace an entire cabinet door. You get the class and beauty of cabinet door stained glass with the ease and convenience of Stained Glass Inc. quick installation. All of our stained glass cabinet door inserts are custom made to perfectly fit your project, and we offer thousands of images to choose from. At Stained Glass Inc., we can customize any of the designs from our huge stained glass collection to fit perfectly in your home or office. Let us know your cabinet door window measurements, and we can custom build stained glass cabinet inserts that fit perfectly and add stunning color and beauty to your decor. Enhance the look of your kitchen, wine cellar, bar, or bathroom with the magnificent look of stained glass cabinet door panels. Custom stained glass is an exceptional way to add color, personality and style to your home. Not only are stained glass cabinet door inserts a unique and beautiful way to update and add charm, but they also enhance and add value. Custom inserts are what we do best, which is why our team of designers works one-on-one with you to come up with colors and designs that complement your existing decor. And we aren't limited solely to kitchen and bathroom cabinets. Our custom stained glass inserts are suitable for curio cabinets as well as bookshelves. Stained Glass Inc. stained glass cabinet inserts truly give ordinary pieces a one-of-a-kind custom look and bring charm and value to existing cabinets. 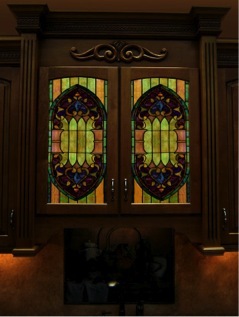 The team at Stained Glass Inc. are here to help you choose the design that is perfect for your cabinet doors. We have a collection of thousands of designs to choose from, or our stained glass artists will work with you and your ideas to create the stained glass door that fits your taste and style. Our expert designers are available to work for you. We can help answer your questions about specific stained glass images or any technical details. We’ll take the measurements, design and color specifications you give us and create cabinet inserts just for your space. 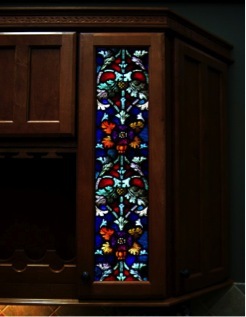 Stained glass cabinet door inserts from Stained Glass Inc. are built to last. Made from high quality polymer glass with uniform strength and no weak spots, our stained glass is virtually unbreakable. Stained glass inserts are 250 times the strength of regular window glass. But their strength alone isn’t their only lasting quality; mineral pigments are heat fused to inserts to create bright, shining color that’s highly fade resistant. Inserts are simple to install to cabinet doors. They are made to fit custom measurements and simply slip into place behind existing cabinet windows. Not only are the easy to install but stained glass cabinet door inserts are simple to maintain. Cleaning requires nothing more than a soft cloth and regular glass cleaner. Regular cleaning will help inserts to stay bright and keep their lustrous shine. The supplies our artists use to produce stained glass windows for cabinet doors is the same high quality material we've used to create art for some of the finest resorts, museums and hotels in the world as well as the Pentagon, the Smithsonian and the Texas State Capitol. Hides cabinet contents better than transparent glass inserts. Quick and simple installation reduces construction time and costs. Quality stained glass cabinet inserts at an excellent price. 250 times the strength of regular glass windows. Adds new charm and beauty to your existing cabinets. Shimmering mineral pigments are heat fused to glass to ensure lasting color. Call or email for speedy assistance. We are here to help you!